Why do holiday breaks go by so fast? I cannot believe it's Thursday already. 1. On Monday, I got a great package in the mail. Inside that package were two Handfuls! 1 purple Handful bra and 1 purple Handful tank. The more I wear Handful, the more I am in love with the company and their product. I now need to buy more tanks - one in each color. I am addicted. The feel of the tank is amazingly silky smooth. I was cuddling with Izzy Monday night and she couldn't get enough of the smoothness and kept rubbing the bottom part of the tank. 2. Today we had another snow storm. I know I posted the other day about running in the snow, but I'm also not afraid to admit sometimes it's not the greatest idea to run in the snow. Today was one of those days. The wind was absolutely brutal. 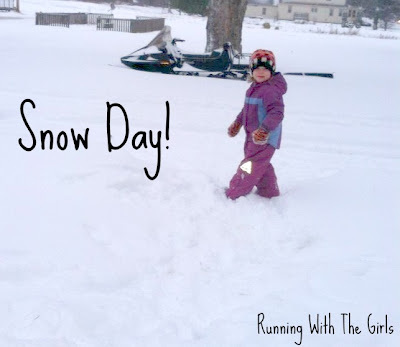 I started out the day thinking I was going to tough it out and run outside, but in the five minutes it took me to walk down to the chicken coop, take care of them, and walk back to the house, I decided that an ice pellet beating was not how I envisioned a snowy run. The snow was coming down awfully fast and the wind was absolutely crazy. In addition to the wind, visibility was pretty low as well. I didn't want to mess with cars on my road. So I opted to head to the gym for a safe run before they closed (early). I was able to get in 6.74 miles this morning. I now only have 16.78 more miles to go to hit my goal of 1600 miles for the year! When I got back from the gym, I was ready to head outside with my favorite little people and we had some fun out there. Although it was in small doses because the wind so cold! 3. My son's feet are insanely large for his age. The other day I happened to look down at his feet and let out a loud gasp. I grabbed my phone and took this picture. This is craziness! Note, I wear a size 9/9.5 in a woman's shoe. I cannot believe how big his feet are! He's not a very tall kid, it just seems like his feet are doing all of the growing right now. How about this post for random? What have you been up to? Are you on vacation? The kids? The Y's were all closed today so I banged out 50 minutes on the bike trainer when I got home. Boo ya! Let's look into that laser hair thing. I'm serious. I love how the snow looks! I used to live in Minnesota and miss it! OR is not that white in the valley! :) Good choice running inside! 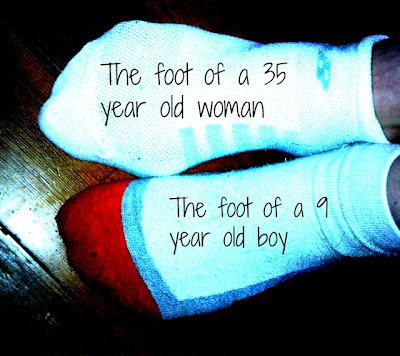 I have a 6.5 foot - your son's foot is bigger than mine! That tank looks so comfy! I love running clothes I can lounge around in all day. I love Handful! I've got to try the tank. I'm glad you got to run this morning. Were you racing Hasty? :-) All I got today was a quick up and back the street with the dogs and shoveling snow (twice). 1600 miles?! You're amazing! I'm dying to try Handful. Since I'm a little, ahem, flat, I think they'd be perfect for me. Gotta wait for that tax check! I love those tanks too, and I am impressed by your son's foot too, that seems really big for a 9 year old! Oh just wait - my son is 11. I've been shopping in the men's dept for him for 2 years so I feel your pain. And it isn't just his feet. He is off the charts (well at least the 11 year old boy charts) for height, weight, etc. He grew 1.5" since the beginning of school and is now 5'6.5", 141 lbs (post flu) and wearing 10.5 mens shoes, 32x32 pants, and the men's T-shirt I got him for Christmas fits a little tight. I'm not ready for him to be a man! I don't really think about how big he is until he stands next to his 11 year old cousins (2 mo older and 7 mo younger) and they come up to his shoulders and weigh half as much with much smaller feet (everything). The pediatrician told me to hope this is the beginning of his puberty growth spurt (though he has always grown about 3" of every school year) because otherwise I'm going to be shopping in the big/tall men's shop by the time he is 14 or 15. She suggested making friends with the moms whose boys play football and basketball. Still no snow here for us. Glad you got in a nice treadmill run and that volume for the year is AWESOME! Will have to check out those tanks. Have a bit of Christmas money burning a hole in my pocket. I need to get one (or 5) of those handful tanks. They are so cute! Way to go on your mileage this year, awesome! Yes, my 12 year old son has size 10 feet and is officially taller than me, and I'm not short (5'6 1/2). They grow so fast! I need to try a handful bra! I've heard so many good things about them! Hope you're having a fabulous holiday! Love that Handful tank, it looks great on you! 1600 miles! You are going to have fun saying that out loud! You should be super proud of yourself! Saw your post on FB - congrats on hitting your goal for the year! I love those tanks, I think I need to get one. And I can't believe the size of your son's feet!!! !